This composition was inspired by the innovative work of landscape architect Mirei Shigermori (1896-1975), who used reclaimed natural and manmade materials to create dramatic geometric garden designs. Materials were chosen for both textural contrast and environmental concerns. Small feather rock fragments saved from previous compositions serve as the paving stones for both the perimeter and the island, which appears to float on the dark pond. 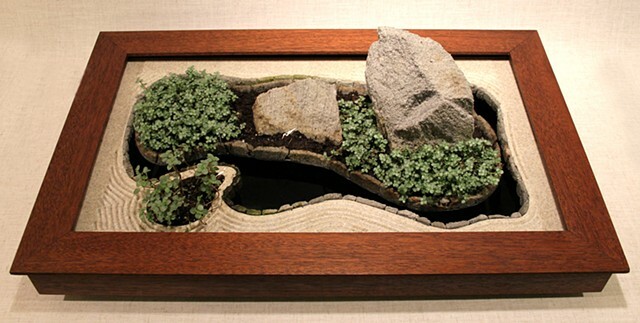 The perimeter, fabricated from a reclaimed remnant of Corian countertop, reflects Shigemori’s raked sand garden designs of waves along a shoreline. Waves and sound from a hidden pump reinforce the shoreline effect. The frame of reclaimed mahogany reflects the surrounding wooden fences and walkways of Shigemori’s courtyard gardens.